The EOS blockchain takes further steps to threaten Ethereum and its dominance in the decentralized app (dApp) world by announcing lower fees. Following an announcement on September 6, the EOS New York has confirmed that 15 block producers have agreed to reduce the cost of opening an account. Under the new protocol, the amount of kibibytes (KiB), the unit used to measure data on the network, has been dropped from four to three KiB. In real terms, three KiB is approximately $1.84, which is 25% less than it was previously. The knock-on effect of this is that joining, creating and running a dApp on the EOS blockchain will be markedly cheaper for developers. As well as being good news for those looking to create decentralized products, the new protocol will make EOS a more attractive blockchain. Reviewing the current dynamic in play, those involved in the project believe the interest from early adopters will soon subside and the network will fail to attract new developers if things don’t change. “EOS account creation cost is an extremely important aspect of the health of the platform. Many users of EOS decentralized applications are early adopters, people who are eager and willing to spend the time to understand the EOS blockchain. But in the future, users will not be as eager,” reads the recent announcement. To tackle what was seen as an underlying issue, the costs have been reduced and new accounts will also be given 1,400 bytes of RAM for free. In addition to encouraging more developers to join the EOS blockchain, accounts are needed to transfer tokens on the network. In essence, accounts are the lifeblood of the network and, therefore, any new users are not only welcome but critical to the survival of EOS. This is something Daniel Larimer pointed out in his Three-Step Plan for Lowering EOS Account Creation Costs. Written back in July, Larimer pushed for increasing RAM at a rate of 64GB a year, something that would increase the supply and, in turn, decrease the value of it. Larimer also advocated for lower account memory usage and free accounts via the Block.one iOS wallet. The CTO of EOS concluded his roadmap by stressing that he is driven to create the most accessible and efficient blockchain in the world. “I am committed to scaling the EOSIO software in both transaction performance and RAM capacity. It is my goal to ensure that EOSIO remains the fastest, lowest latency, most scalable, and easiest to use blockchain platform on the market,” wrote Larimer. In the wider context, the update from EOS could prove pivotal in the long run. Although Ethereum has created an impressive network, it’s far from perfect. Network congestion recently caused GAS prices to soar, causing users to pay high fees. As well as the blockchain’s dApps suffering under the weight of the demand, scalability remains an issue. In fact, for many, Ethereum has stalled in the last two years and it’s inability to evolve means it’s starting to show its weakness as a blockchain. Finally, there are those that argue Ethereum’s ETH token is useless. Writing for TechCrunch, Jeremy Rubin argued that economic abstraction makes it possible for developers to operate on the blockchain but swap ETH for other coins. Although developers such as Mind are still setting up camp on the Ethereum blockchain, EOS is clearly making a play to become the number destination for dApps. 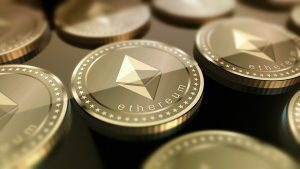 Is this the reason we’ve seen the price of Ethereum fall from $358 to $195 in the last month? Perhaps not. However, there’s no reason it couldn’t force a drop in the coming months. By positing itself as a more develop-friendly platform that the market leader, EOS is naturally solving the scalability issue that’s dogged Ethereum. What’s more, it’s giving the blockchain a better chance of creating an ecosystem that general consumers could actually benefit from. Indeed, while there are some interesting projects on Ethereum, the majority are yet to become a mainstream success. Although the same is true for EOS dApps, the new protocol certainly has the power to change that and, in turn, stir up the blockchain business.